Featherston is the gateway to the Wairarapa, a welcoming sight as you sweep off the Remutaka Hill. Amongst the cafes and antique stores of Featherston, you'll find the Fell Locomotive Museum. It houses the only Fell engine in the world, once used on the old Remutaka Railway, where its extra traction was specifically designed to cope with the steep incline. Stop and get up close to the stunning Featherston Camp Sculpture on the Main St.
Amongst the cafes and antique stores of Featherston, you'll find the Fell Locomotive Museum. It houses the only Fell engine in the world, once used on the Remutaka Railway where its extra traction was specifically designed to cope with the steep incline. See the locomotive and its brake-van up close, and watch films that bring the old days of Wairarapa steam travel to life. Next door is The Featherston Heritage Museum which tells the story of the historic Featherston military base and its role as a prisoner of war camp in World War II, and provides a background to the nearby Peace Garden, a hauntingly beautiful memorial stand of 68 Japanese cherry blossom trees. 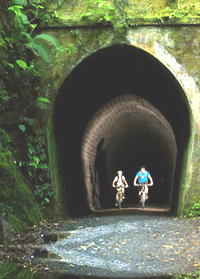 You can follow the old railway line on the Remutaka Rail Trail through tunnels and over ridges as it winds between Cross Creek near Featherston to Kaitoke on the Upper Hutt side. Cycle from Featherston to Cross Creek on the off-road limestone trail. 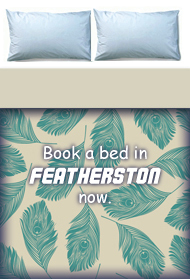 Featherston is a Booktown: home to an annual festival celebrating everything to do with books, writers and reading. The festival includes writing workshops, poetry readings, talks by authors and illustrators, theatre performances and a book fair featuring stalls with rare and second hand books. 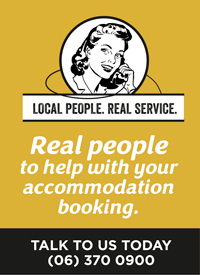 Featherston Booktown is part of a global concept, with the most famous booktown being Hay-on-Wye in the UK. Check out the growing number of book stores open all year round Featherston. Head further east on State Highway 2 and you'll reach Tauherenikau Racetrack which offers equestrian events and jet-boating amid sprawling grounds and tranquil native trees. Enjoy the charming countryside of Featherston and take a short drive to the Country Cooking School. Explore delicious food and recipes featuring the freshest, seasonal ingredients from the Country Cooking School farm. South of Featherston are the shores of Lake Wairarapa, the largest wetland area in the lower North Island and a significant nesting ground for native and migratory birds. The 9,000 hectare Wairarapa Moana Wetlands Park provides a perfect viewing hide for watching wetland birds in a magnificent environment - Te Rakau Birding can help with this! And if you're after some coastal excitement, Featherston is a departure point for Lake Ferry and Cape Palliser. An exciting drive takes in steep cliffs, signs of an 800-year old Māori settlement, tiny Ngawi fishing village before bringing you to Cape Palliser Lighthouse, New Zealand fur seal colonies, surf beaches, swimming, fishing, diving and Māori legends. Wharekauhau Country Estate is just out of Featherston. This luxury lodge is perfect for intimate weddings, as a conference venue or for a luxury getaway.